Online Sacraments? Or do we need Real Bread? I was invited by UCC Local Church Ministries to give a presentation on our experiences with online congregations as the UCC is preparing to establish Extravagance UCC as an online congregations. I raised the question of online sacraments. I was quite surprised that this question was not a really big issue – quite contrary to my experience in Germany. If members of a congregation which meets online are united by a covenant – then why should someone who wishes to become part of that covenant be prevented from being baptized within this congregation? Interesting thought – which works in a congregational and/or reformed context. And the discussions needs to be carried on. 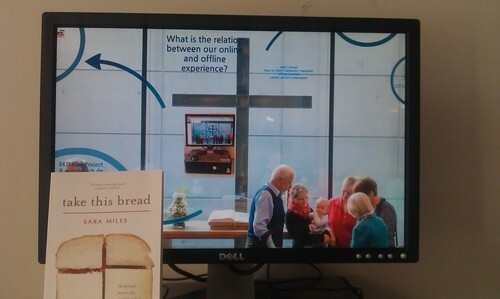 While preparing my presentation, I was reading Sara Miles’ book Take this Bread. She shares her story, how the actual bread in the communion played an import role in her becoming a Christian. (It is theologically unthinkable for Germans that partaking in the Lord’s Supper comes before being baptized.) Throughout her book, Sara Miles emphasizes how food and the act of sharing food is spiritually important, too. What does this mean for online sacraments. You cannot share food, pass it to someone if she/he is at a different location. Then everybody eats his/her own bread. What does this mean for online communion? I am wondering….